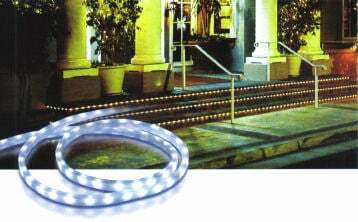 LED DuraFlex measures 5mm x 8mm making this product light-weight and flexible. LED DuraFlex can be ordered in voltages ranging from 240v/120v/24v to 12v and comes in five different LED colors — Red, Yellow, Blue, Green and White. LED DuraFlex Mini Flat is an ideal lighting fixture for Building outline, Coves, Walkways, Stairs, Under Cabinets, Aisles, RVs, Boats and many more applications. LED Duraflex is waterproof and a low voltage lighting solution. Mounting track, carpet trim, connectors (X,L,T's & end caps) are also available for LED Duraflex.